Since its beginnings in 1876, ARS has employed state-of-the-art technology as well as equipment developed in-house, in order to produce the highest quality pruning saws and shears possible. 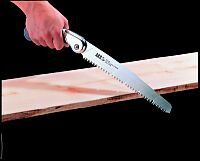 Naturally the saws do their job of cutting, very well and due to their light weight and new, ergonomic design they are easy to use. Unlike conventional saw teeth which are filed and alternately bent, the ARS blade is taper ground, and each tooth is is honed to a precise KNIFE-EDGE SHARPNESS. The unique patented blade produces such a remarkably clean cut it looks as though it has been planed. The PRECISION GROUND TEETH have a razor edge, and are not imprecisely set as on conventional saws. The FAST, EASY PULL ACTION reduces sawing time by at least 50 % over ordinary saws, increasing your pruning productivity in the vineyard, orchard or garden. 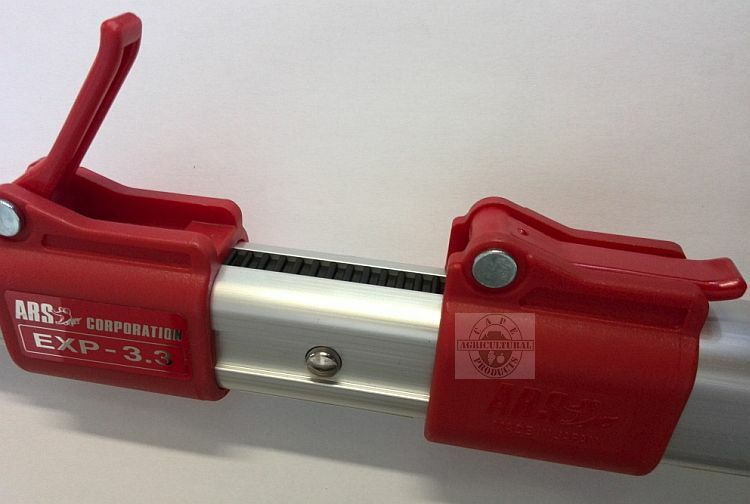 The high-tech, third generation cutting edge of the ARS products revolutionises hand sawing! Anyone can cut quickly and safely with ARS Turbocut or Super-Turbocut saws. The ARS pruning saws and shears that Cape Agricultural Products supplies in South Africa are listed below. We have chosen saws that we feel will be able to satisfy virtually any hand sawing job in the agricultural and horticultural environment. The Z-17 folding saw has a larger handle than the 210-DX but still has a straight blade. This saw also has a slightly longer blade [170mm] than the 210-DX saw [150mm] and comes with a tough, injection moulded handle, that is designed for comfort and safety. The blade is hard chrome plated to eliminate rust and the precision ground teeth are razor sharp, ensuring a fast, clean cut. The Z-17's blade is locked in place with a spring-loaded plastic clip that activates as soon as you open the blade. Spare catch sets and nut/bolt sets are available. Total length when open is 383mm and the weight is 175grams. As with all ARS pruning saws this works on the pull stroke for safety. Probably the most popular folding pruning saw being used in the South African vineyard and orchard industry at the moment, also know as the CAP-210 saw. This saw comes with a tough, injection moulded handle which makes it difficult to break. The blade is hard chrome plated to eliminate rust, and taper ground to prevent it sticking in the cut. Keeping the blade open is easy with the very simple catch which hooks onto the blade and locks in place. Total length when open is 350mm and the weight is 140grams. This 210-DX is very handy for keeping in your pocket, or in one of the leather holsters we can supply. Keep one in your vehicle for any odd pruning job that may arise. 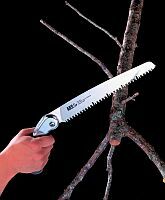 As with all ARS pruning saws the 210-DX works on the pull stroke for safety. As part of Cape Agricultural Products mission to support the products we sell, you are able to purchase spare blades, nuts and bolts, and catch sets for this saw. We have recently added the GR-18L folding saw, which has a curved blade to the range of ARS saws that we offer to the South African market. This folding saw has a very comfortable, virtually unbreakable grip that is slightly larger than the handle of the 210-DX and is formed to ensure the user's hand does not slip while sawing. The curved blade is hard chrome plated and taper ground. The curvature of the blade helps to keep it in the cut so no energy is wasted. The blade locking system is a very simple catch which hooks onto the blade and locks it in place. Total length when open is 410mm and the saw only weighs 165grams. 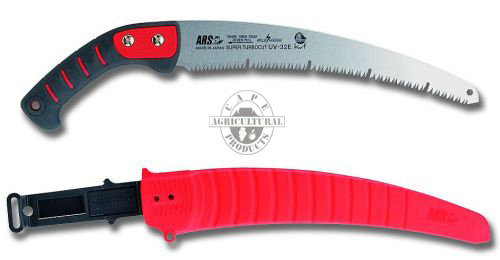 The UV-32E saw, which also has a curved blade, is another excellent pruning saw from ARS corporation. This saw is specifically designed for arborists, but is just as effective when used in fruit orchards and landscaping applications. The rubber coating on the ergonomically designed grip, makes sawing a pleasure. The 32cm blade is taper ground, impulse hardened and hard chrome plated which results in superior durability and hardness. Due to the fact that the UV-32E saw has a "Super Turbocut" tooth design [clearly visible in this picture] smooth cutting performance is enhanced when cutting wood horizontally, vertically or any other angle. The saw is sold with a sheath that has a guide roller to ensure smooth movement of the saw into and out of the sheath. The sheath helps to prevent injuries and is handy for tree climbing. The belt clip on the sheath is reversible, enabling left and right handed users to use the saw with comfort. With FPA approval, this ARS saw also received the approval of the German Center for Forest Work and Technology (KWF). Another very popular saw used in the orchards of the Western Cape in South Africa. Also know as the CAP-27 saw. This saw has a 2-Way tilt grip and Super Turbocut teeth on the 270mm blade to increase productivity during the pruning season. 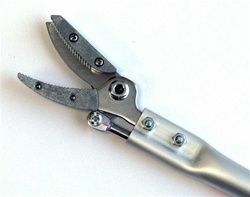 The 2-Way tilt grip [the angle of the blade is changed with a thumb operated lever] facilitates pruning trunks, or branches, high or low or at any angle. The specially set teeth, immune to sawdust deposit, cut easily and smoothly into green wood, either straight, across or diagonally to the grain. The lightweight, easy to carry sheath has dual rollers at its mouth which firmly hold the saw, even when turned upside down. The rollers also help the saw to be pulled out of the sheath smoothly, without damaging the teeth. Weighing only 200grams, and with a die cast aluminium handle covered with rubber, you can prune effortlessly without fatigue. Spare blades and nut/bolt sets are available. This saw, also known as the CAP-32, excels when used in orchards and is recommended for use in olive trees. The saw can be used to for cutting branches up to 9"/225mm in diameter, utilising a longer tooth pitch than the other saws on offer, over a long 32cm blade. The hard chrome plating eliminates rust and resins will not cling to the blade and green wood will not clog the teeth. A very comfortable, ergonomically curved, beechwood handgrip prevents hand slip and fatigue when pruning in the orchard and olive grove. This saw has a strong, broad blade which can handle some of the more demanding pruning jobs. Cape Agricultural Products recently introduced one model of the ARS pole saws and poles to the South African market. These pole saws and poles are exceptional quality and have been very well received by landscapers, farmers, and arborists. The UV-47 pole saw is a very effective pole saw, with a large blade for use in landscaping, forestry and general arborist applications. The blade has a hooked tip, which is useful for removing branches and twigs from the canopy of trees and plants. A bark cutter is standard, this prevents peeling of the bark below the cut and also helps with the removal of twigs and creepers. This saw can be mounted on the 3-section ARS telescopic poles as pictured here. The "oval/square" tube design of the ARS poles ensures less flexibility when being used. The saw is attached with a simple, effective system of spring loaded push buttons. Extending the telescopic pole is very easy and it is kept in place with the use of push buttons and locking levers. This also means the pole can be fixed at any length you require. Click here to see a close up of the locking mechanism. A sheath/cover is supplied with the saw to prevent injury when the saw is not in use, this also protects the teeth from damage during transport. The 9F-10 saw sharpener is available to help you maintain the sharp edge on the blades of your ARS saw during intensive use. 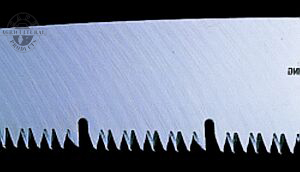 The diamond profile of the file allows the user to get between the teeth on the saw and file them sharp. As with all professional tools the blades will get blunt/dull after intensive use and they should then be replaced with an original ARS blade. This will ensure your ARS saws give you many years of excellent use. ARS pruning shears are exceptional value for money and the ARS corporation believes that a "good cutting edge" can only be made from high quality steel. ARS has full control of the grinding process of the blades that go onto their pruning shears, enabling them to produce the small angles required for a pruning shear to cut effectively. Over the past few years ARS has incorporated new design features into the pruning shears, making them more ergonomic and durable. 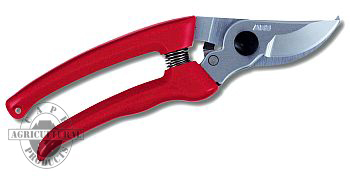 The VS-8Z and VS-9Z pruners can be used for commercial pruning in vineyards, orchards and horticulture. We introduced these shears to the South African market during the 2009 pruning season and have had very positive feedback regarding their performance relative to price. The ergonomically shaped handles are die-cast aluminium for extra strength and the non-slip grip makes it easier to control the pruner during intensive pruning. The polyurethane cushions on both handles, together with the quality spring, ensure that the user's hand, wrist and forearm are not placed under excessive stress, leading to injury, during the pruning season. The innovative locking system works on the basis of "squeeze and open" as can be seen here. All the user needs to do is press the handles together and the spring-loaded locking catch will open up, allowing you to begin pruning. The catch will then stay open as long as you are busy. Spares are available to maintain the shears. Click here to see a spares diagram for the VS 8 and 9 shears. The CB-8 pruner from ARS is a very effective pruner with exceptionally sharp blades - even thicker branches or vines can be cut using these shears. The design of the shear allows the blade to open wide, with a relatively small grip opening. The upper handle of the shear is rubber coated to fit comfortably into the palm of the hand, eliminating fatigue. Most pruning jobs in vineyards, nurseries and landscaping are handled with ease with the CB-8. 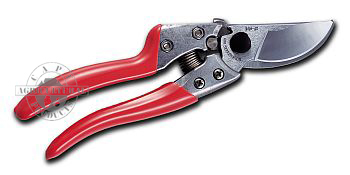 The CB-8 pruner has the same innovative "squeeze and open" locking system that is used on the VS8 and VS9 pruners. The 130-DX pocket pruner is a precision pruner for lighter duty pruning, especially suited for smaller hands. The hard chrome plated blades are precision ground to ensure smooth, clean and easy cutting. Due to the hardening process the blades last longer and withstand rust. The anatomically shaped handles, together with the angled cutting head make it easier to get into narrow spaces for precision pruning. The rubber buffer and easy locking system make this a very simple, but effective pruning shear. This leather holster from ARS is ideally suited to hold any one of the ARS pruning shears above, as well as other pruning shears you may already have. Made from high quality leather, the design of the holster means it can be used in one of 2 ways - either with a belt through the loops, or by using the metal clip to clip onto a belt. The 160-0.6 cut and hold pruner is ideal for cutting roses and other plants where there is a possibility of getting injured by the thorns. This pruner is also available in extended length versions - a 1.8 and 2.4Mt lengths, enabling the user to cut at height without having to use a ladder. The tools are lightweight so less strain on the user's arms. 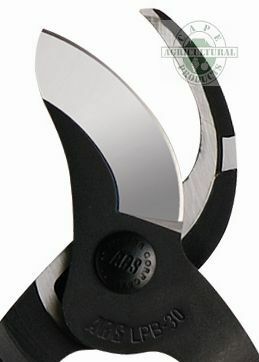 The LPA-30L anvil lopper from ARS features an anvil head and cutting blade that is very effective for thicker branches. The blades are drop forged for extra strength, and the the lopper is ergonomically designed and engineered to ensure greater cutting power, with the extra lever action assisting the user. The strong, yet lightweight aluminum handles ensure an excellent weight to power ratio. The LPB-30M professional bypass lopper from ARS has recently been improved for greater cutting performance. The tubular aluminium handles are lightweight and durable, yet are able to be used in heavy duty applications. The shape and the sharpness of the blade has been improved, the shape being ideal for use in orchards, as well as vineyards where thicker vines have to be cut. The improved heavy duty shock absorbers reduce the shock transferred to the arms when cutting. Click here to return to our main pruning page.